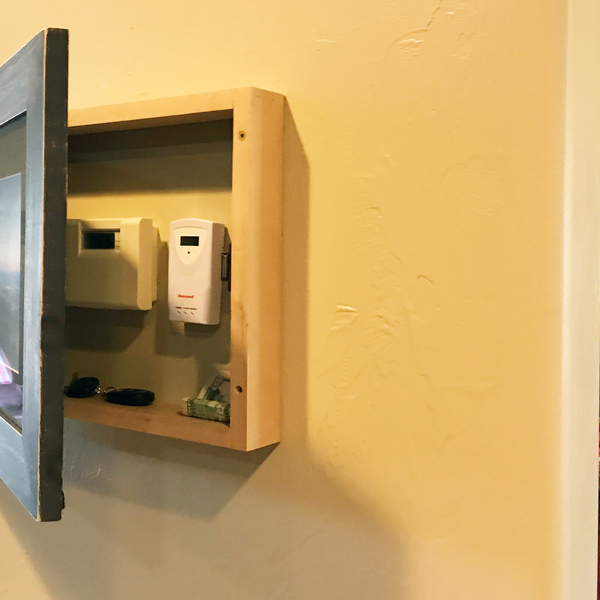 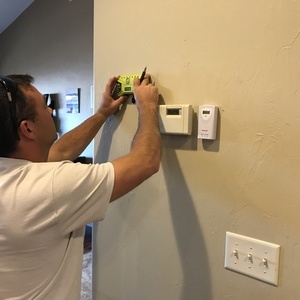 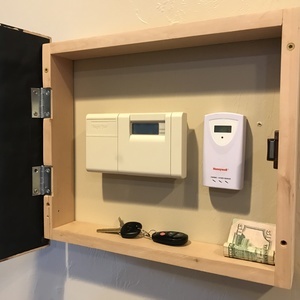 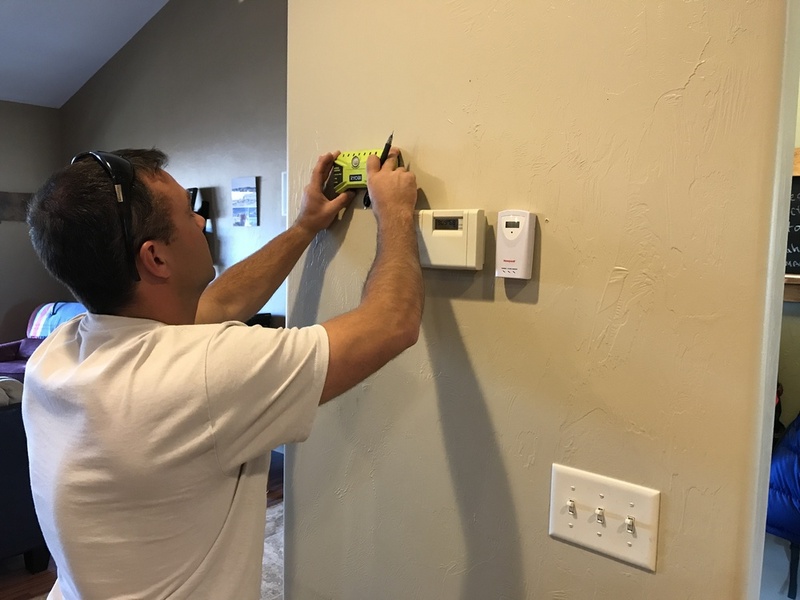 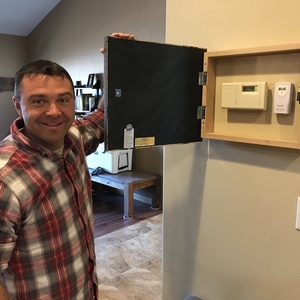 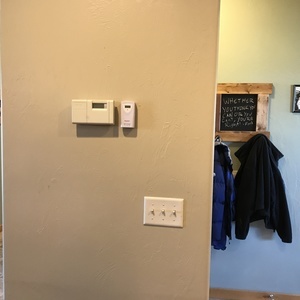 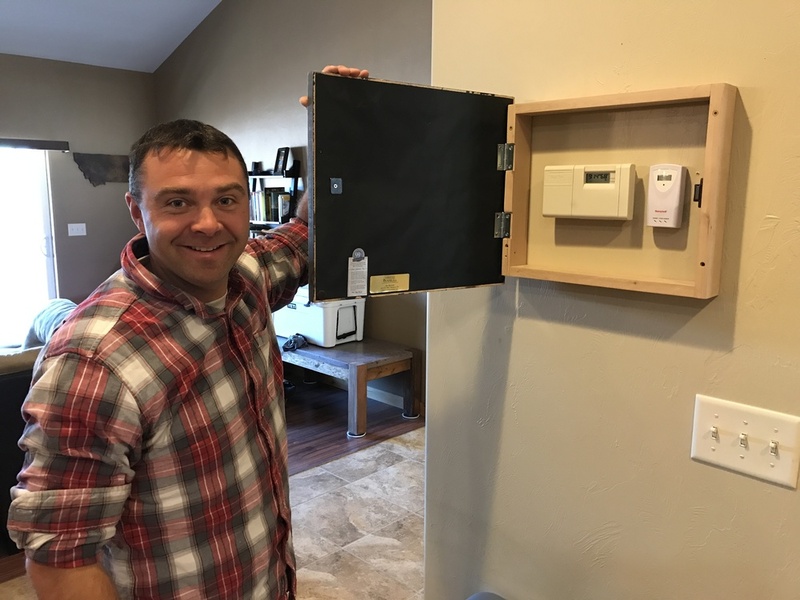 Hide ugly thermostats, security systems, weather stations, and other controllers with a simple to build hidden storage box. 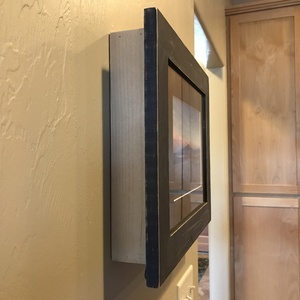 This box can be mounted to your wall and covered with a framed photo or wall art of your choice. This project can be completed in 1-2 hours for under $25. 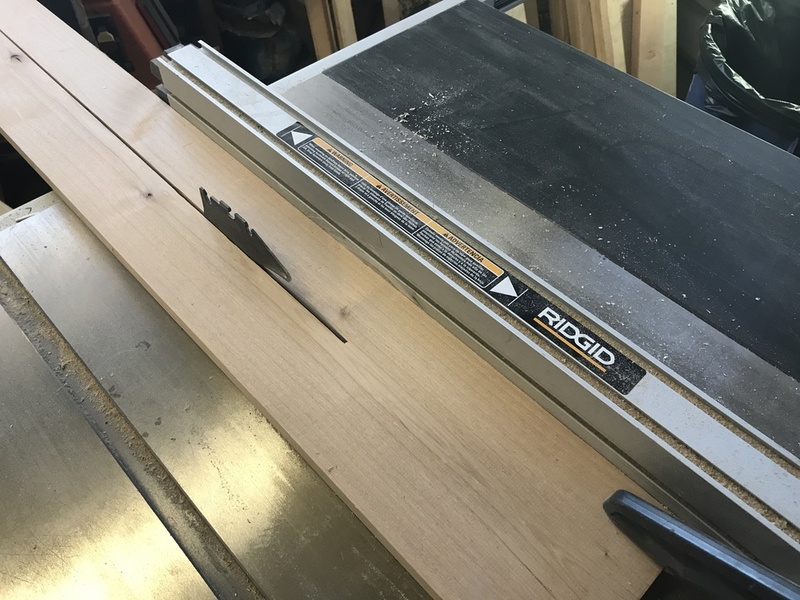 Rip the width of the board down in size on a table saw so they are wider then the depth of the items you are wanting to cover up. 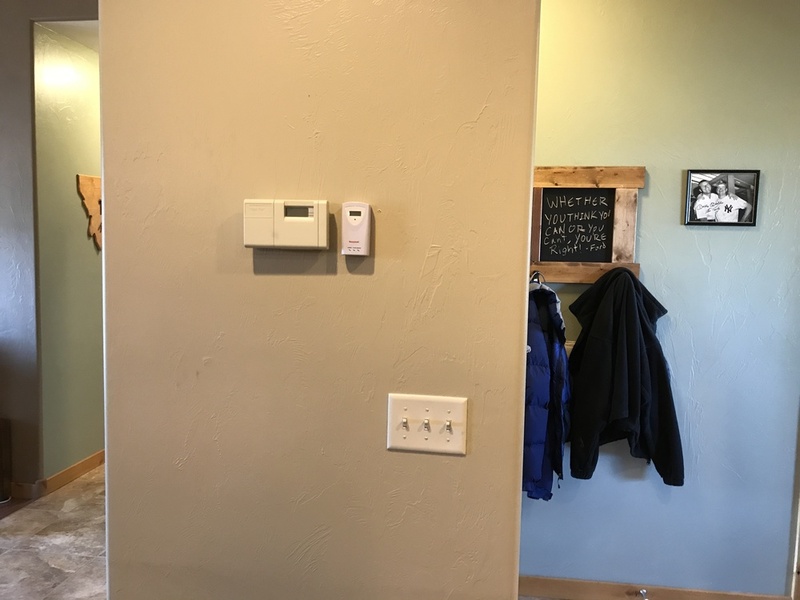 My thermostats were 2 inches thick and so I cut the width to 2 1/4 inches. 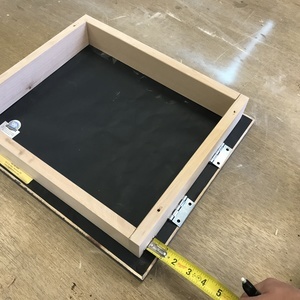 You can buy a standard board that is 2 1/2 inches if you don't have a table saw or would like to make the project easier. 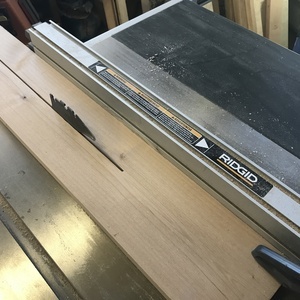 The boards are 3/4 inch stock. 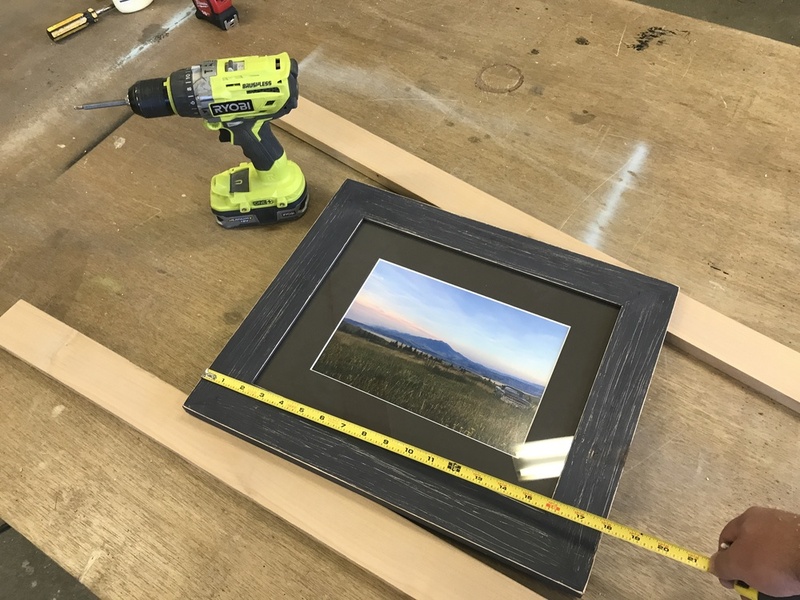 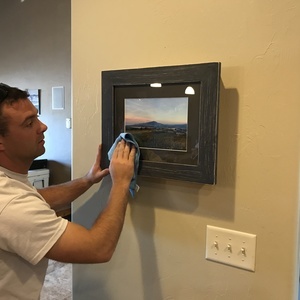 Measure the width of your art and frame. 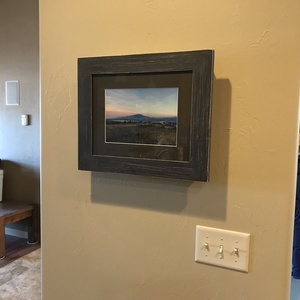 The outside of the frame was 18 inches wide x 15 inches tall. 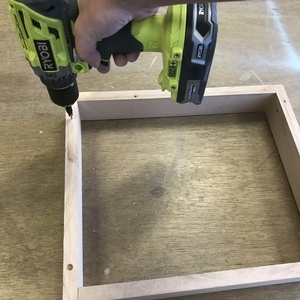 I chose to leave a 3/4 inch gap around the perimeter of the storage box and the outside of the photo frame. 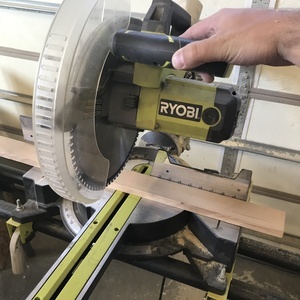 Therefore, I cut the vertical boards to 13 1/2 inches and the horizontal boards to 15 inches. 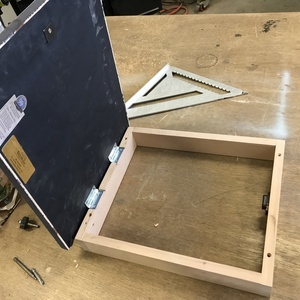 The 15 inch board ends are covered by the vertical boards. 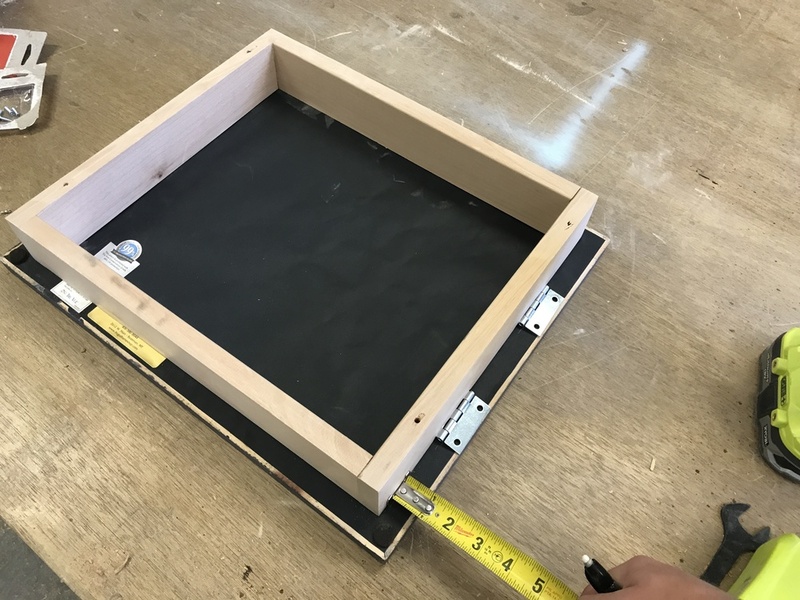 So the total width of my storage frame is 16 1/2 inches. 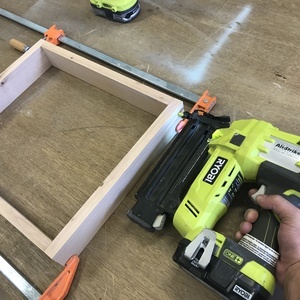 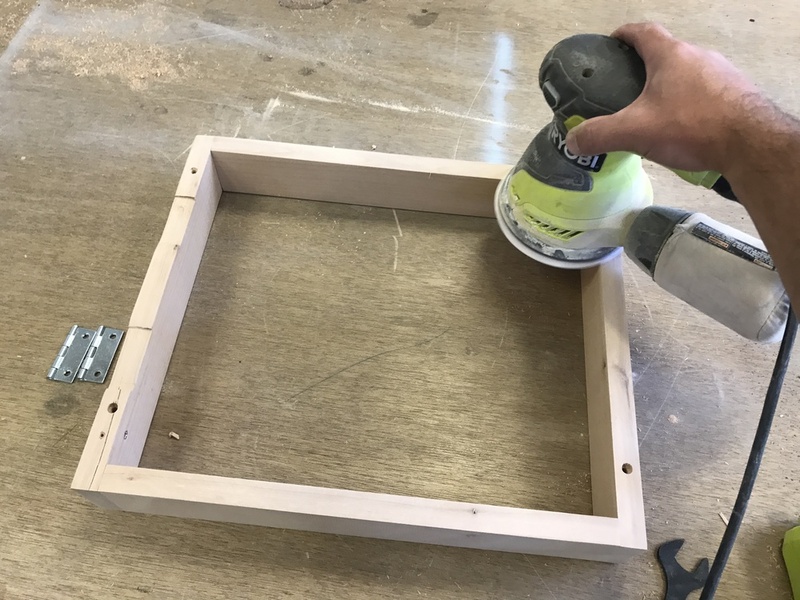 Cut the boards to form your storage box on a miter saw. 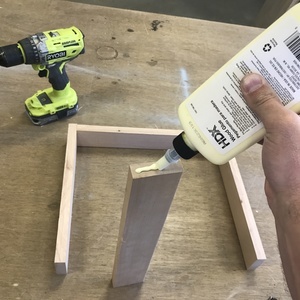 Glue the ends of the two horizontal boards. 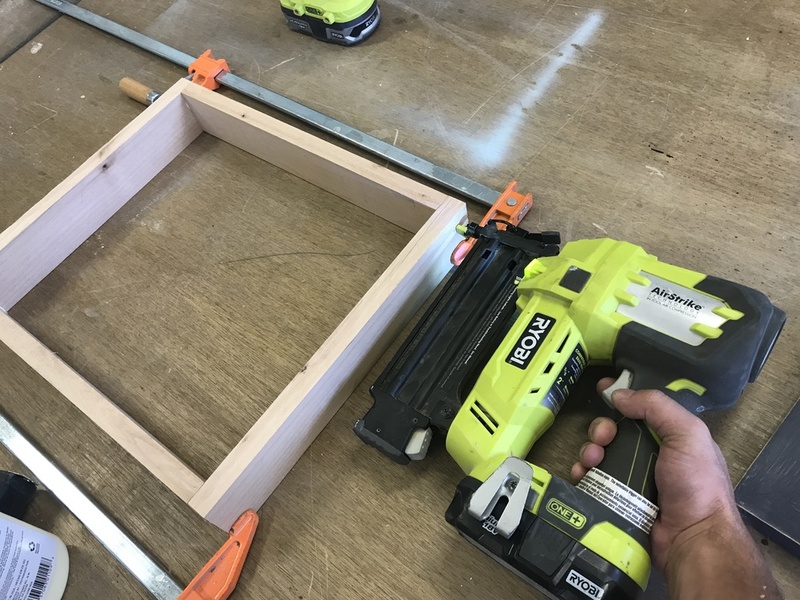 Clamp the box and then insert 18 gauge 1 1/4 inch long brad nails. 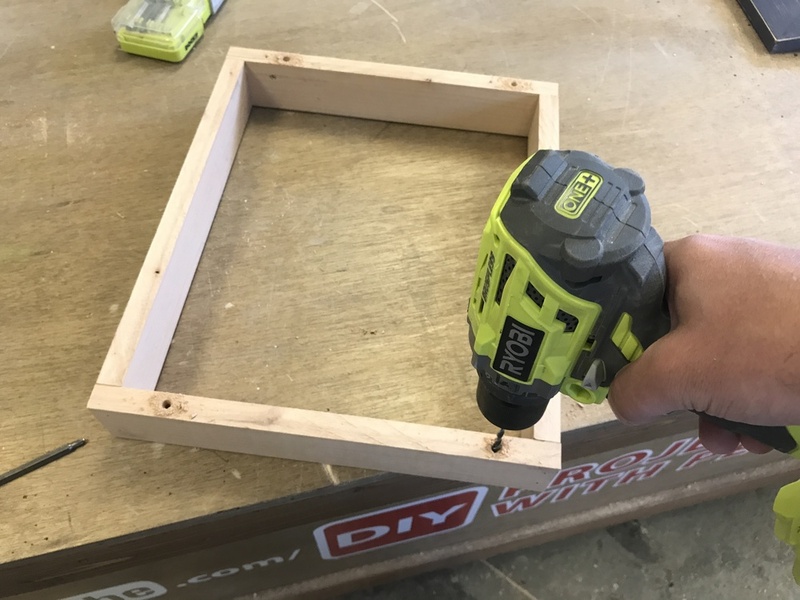 Use a counter sink bit to create a dimple in each corner so screws will sit flush in the frame. 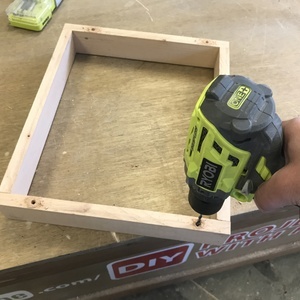 Insert a drill bit at each corner and go all the way through the board. 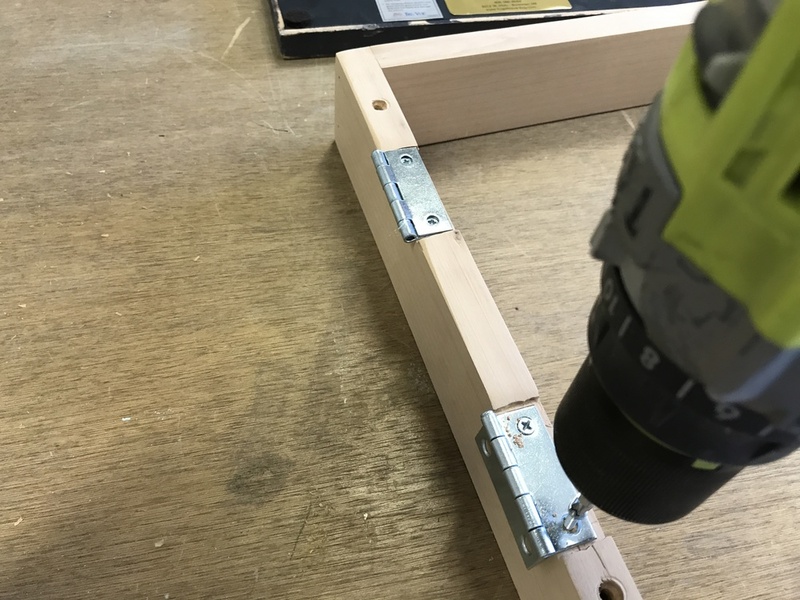 This will be for the screws to go through to attach the storage box to the wall. 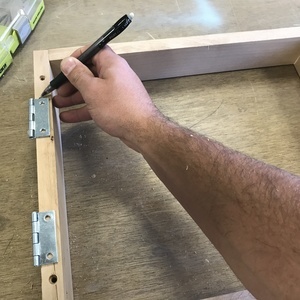 Determine placement for each hinge. 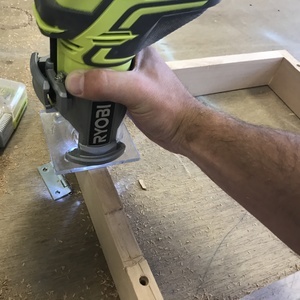 Use a palm sander to route an area so the hinge sits flush with the front of the box. 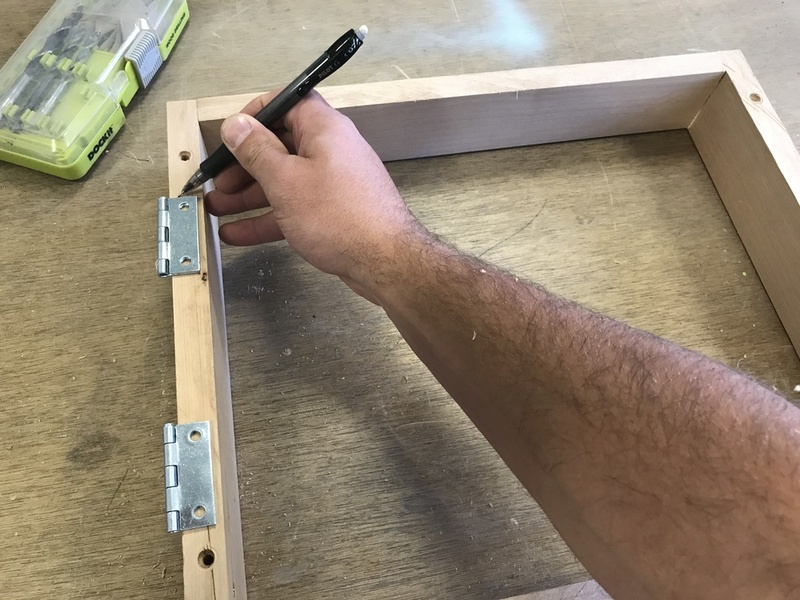 The depth should be the thickness of the entire hinge. 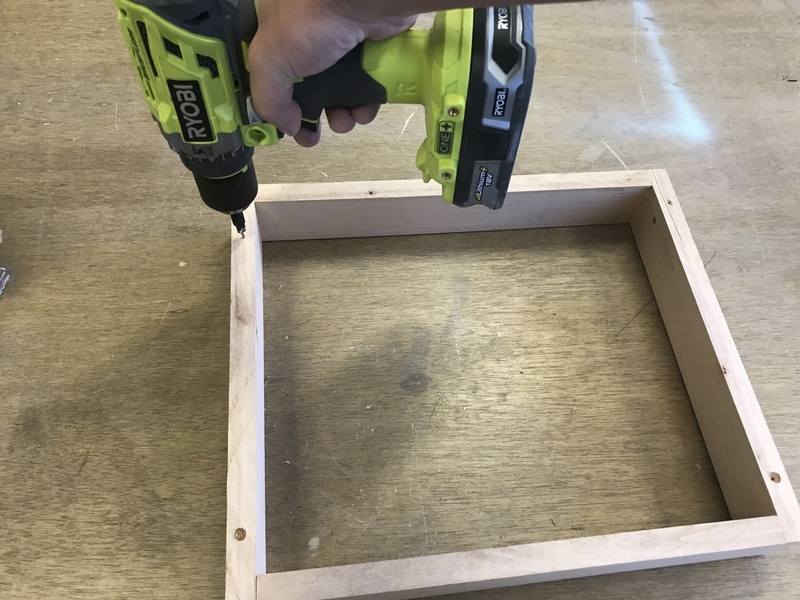 Sand the storage box with 220 grit sandpaper. 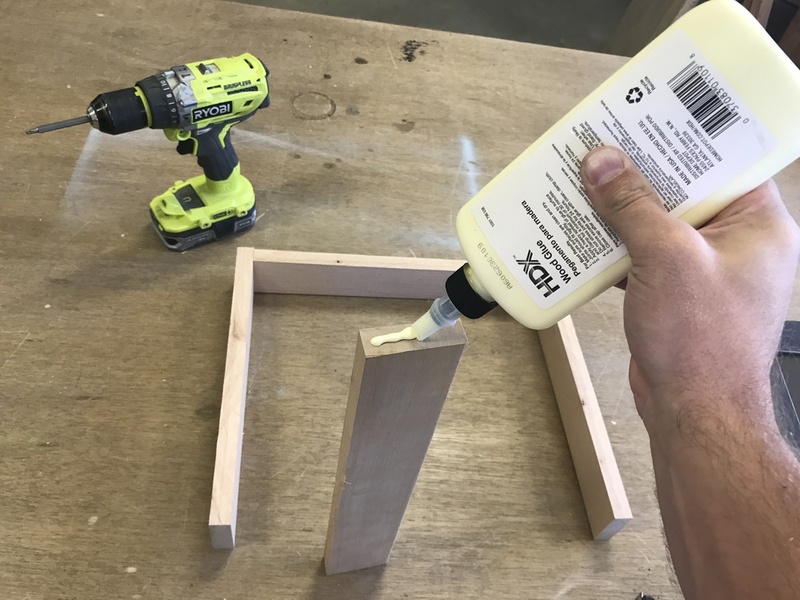 Apply a finish of your choice after sanding. 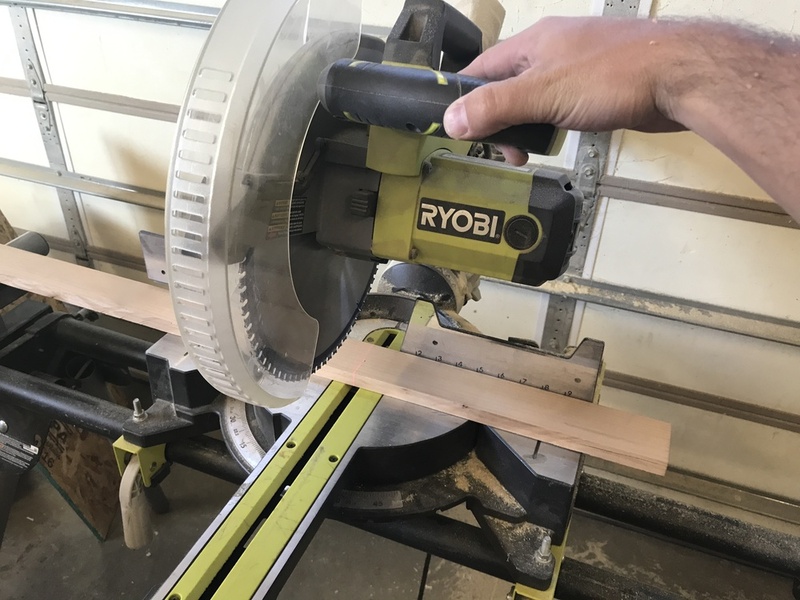 I chose to leave the wood for my project natural. 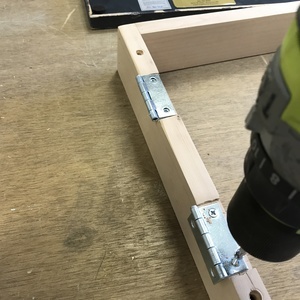 Attach each hinge with short 3/4 inch wood screws. 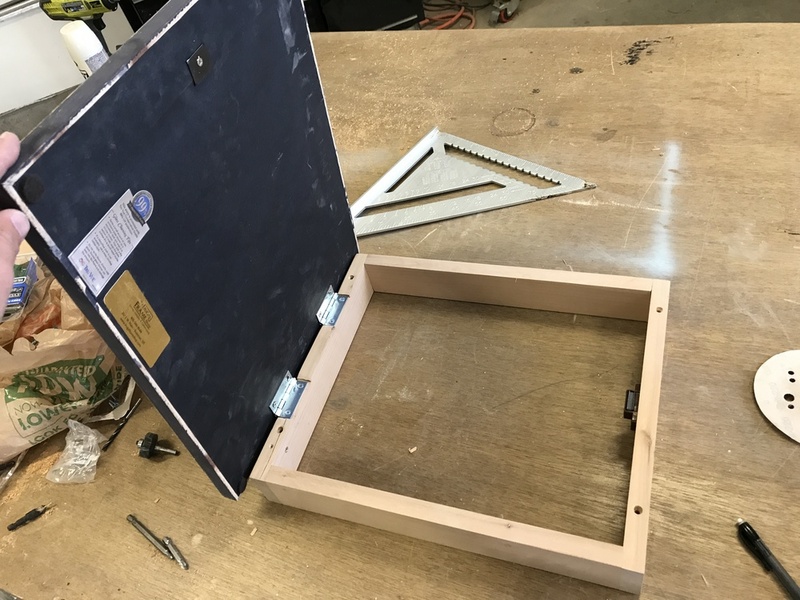 Center the storage box on the backside of the artwork. 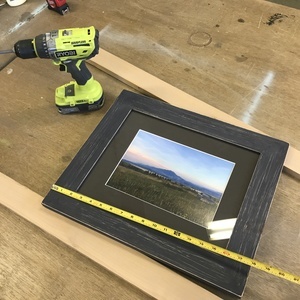 Determine hinge placement and attach the hinges to the backside of the artwork frame. 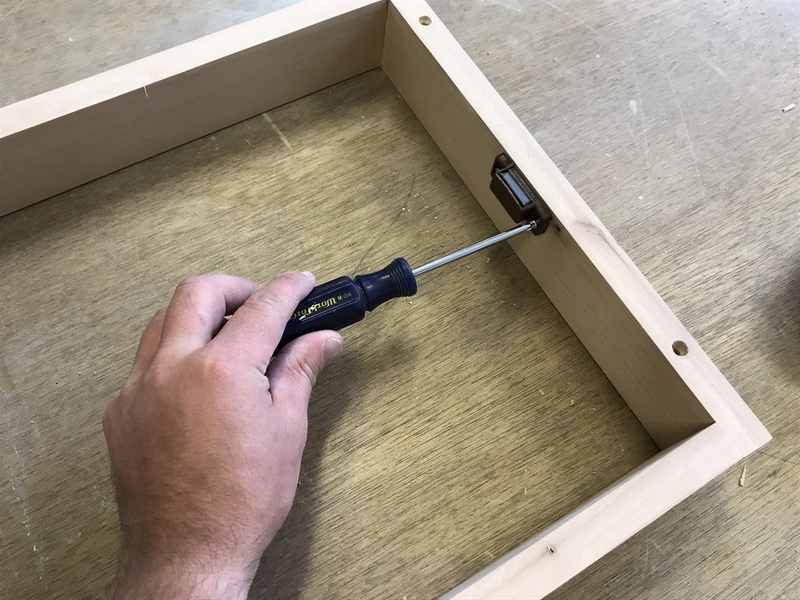 Attach a magnetic cabinet clasp to the inside of the storage frame. 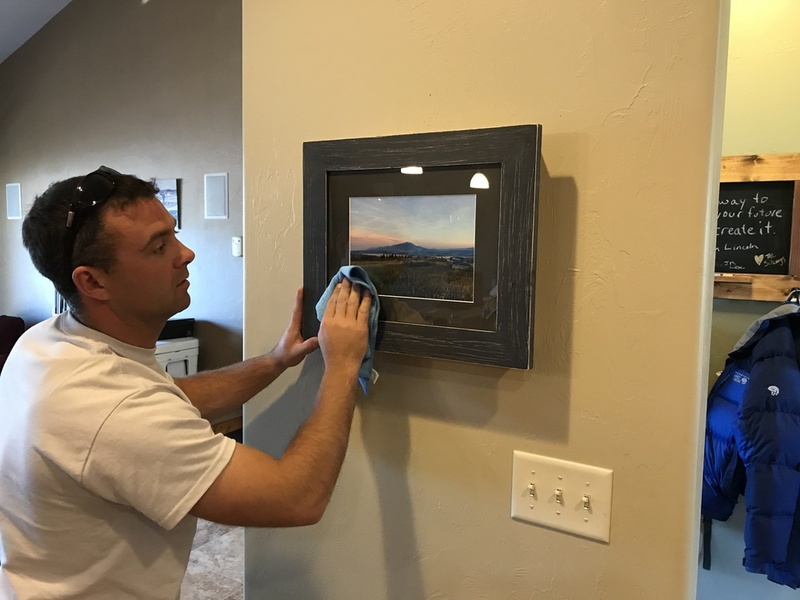 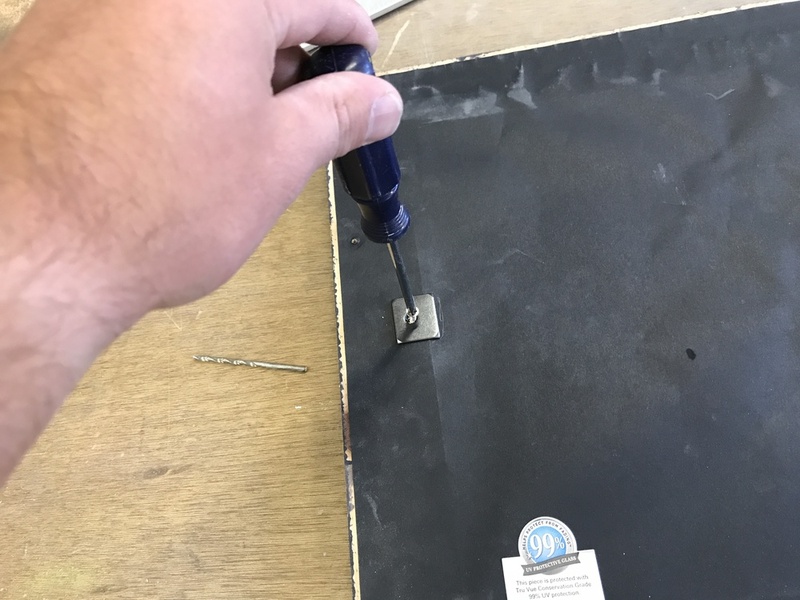 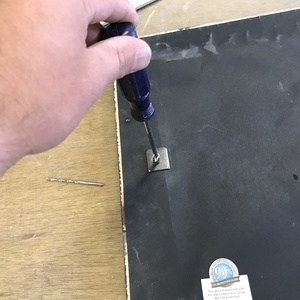 Attach the metal portion of the magnetic clasp to the backside of the wall art. 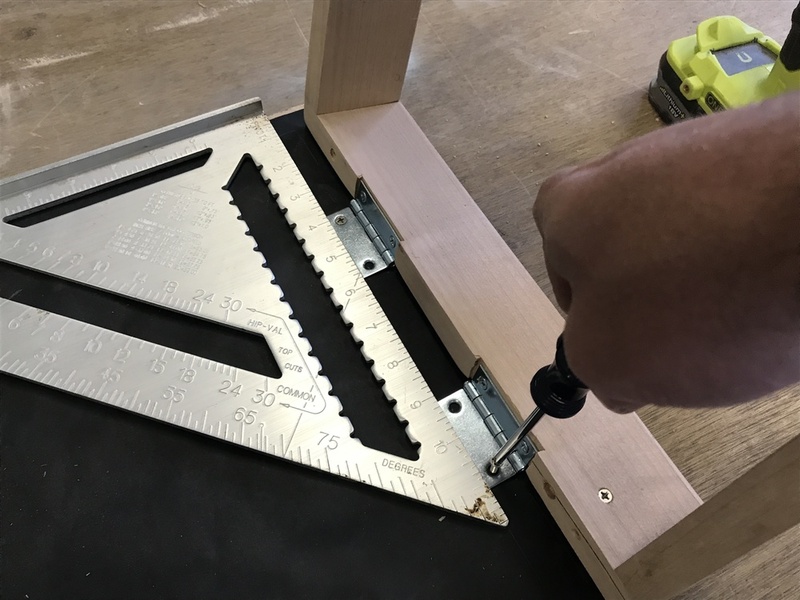 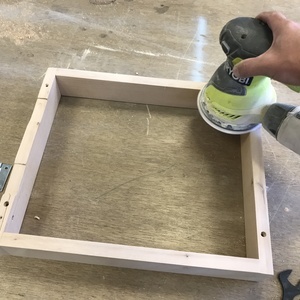 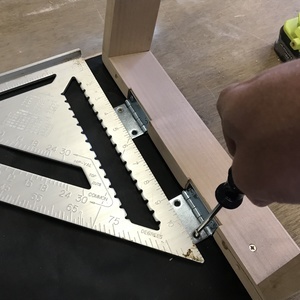 Check to make sure the box is lined up square to the frame and that the hinge system functions properly. Take a look at the items that will soon be covered. 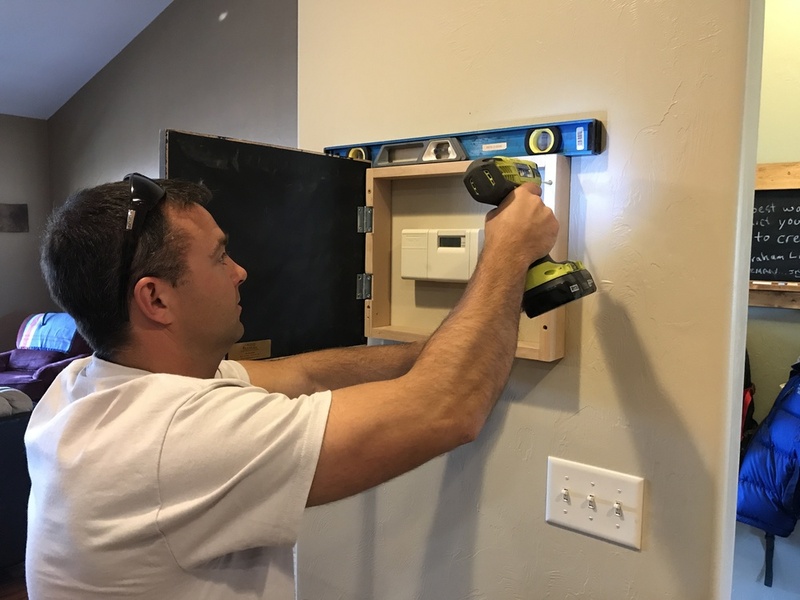 Your new hidden storage is going to look great! 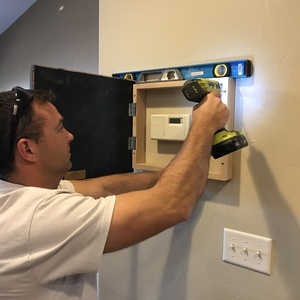 Use a stud finder to try and find a stud in the wall for the screws to connect to. 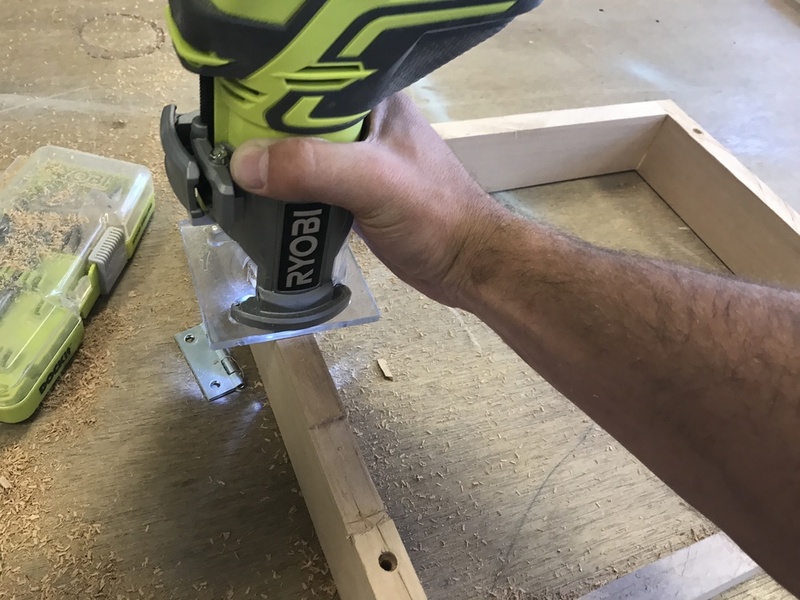 If you won't hit any studs I'd recommend using drywall anchors. 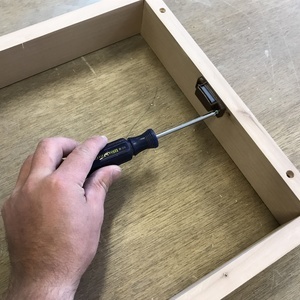 Level and then secure the hidden storage box in place with long screws. I used 3 1/2 inch long wood screws and countersunk them.